This week we have a giveaway with neuLash and Anastasia. Total retail price for this giveaway is around $175, so this is a big one. One winner will receive one box of neuLash and one Brow Definer from Anastasia. What is neuLash you ask? Well, it's a new eyelash enhancer that helps promote fuller and more luxurious-looking lashes. Apparently, no matter how short, brittle, thin or sparse your lashes are, this serum can help in just 30 days. Now, we here are Beauty in Real Life have not tried this so we are not able to comment how on well it works. If you enter this contest and win, we would love to hear how it works at the end of the 30 days. neuLash is sold for $150 and can more information can be found at neuLash.com. neuLash is ophthalmologist safety-tested and is ideal for women and men, brittle, weak, thin, or short eyelashes, contact lens wearers, those who have eyelash extensions, or those who have undergone radiation treatment. neuLash can also be used to improve the appearance of sparse, thin eyebrows. Clinical studies have found neuLash to be safe and gentle to eyes, yet extremely powerful in its stimulating and rejuvenating properties. We are also throwing in an Anastasia Brow Definer ($22), so once you have those beautiful lashes you can highlight them with some maintained brows. The brow definer is a dual ended Brow Pencil and Brow Gel work together to create perfectly shaped brows. Use the velvety Ultimate Brown Brow Pencil to precisely fill and define. 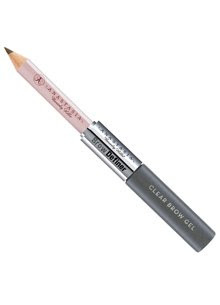 Use the Clear Brow Gel to keep unruly brows in place all day without flaking. We love multi-tasking beauty items (anything to get the job done faster) and to have a pencil and the brow gel in one item is brilliant! For more info on this and other Anastasia products, check out her website at anastasia.net. To enter the giveaway, send us an email at beautyinreallifecontests@gmail.com with "neuLash Giveaway" in the subject line. Be sure to include your full name and mailing address and your email address. We will randomly select one winner May18th at 11m EST. The winners will be announced the next day, Tuesday, May19th. Alright, just to clarify...One entry per person, duplicate entries will not increase your odds of winning. For this giveaway, only US residents may enter. You have from now until May18th at 11:00 PM EST to enter. *Please Read This: If you fail to include all information we will disqualify your entry. One winner, chosen at random, will receive the prize mentioned. Duplicate entries will not improve your chances of winning. Giveaway sponsored by neuLash and Anastasia. Some restrictions may apply. Open only to US residents only...sorry. Entries will be accepted through 11:00 pm EST on Monday, May 18th. Thanks for the opportunity to win some amazing products. I sent in my entry.